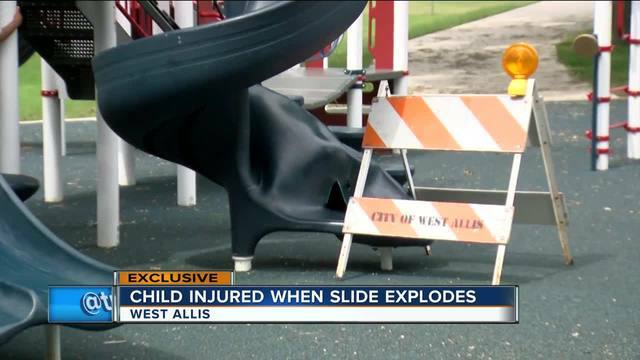 A slide has been removed from a West Allis playground after it exploded and injured a child. An investigation is underway into what could have caused a hole to form at the base of the slide at Reservoir Park, and the victim's mother is waiting for answers. "It was just so confusing," Diana Storniolo. Nine-year-old Giuseppe Storniolo was with his younger brother and sister and his parents Wednesday evening when something went terribly wrong on the playground. "I just heard like a big explosion so I thought maybe something fell," Diana said. She said her son suffered second-degree burns. "I would like them to find out what went wrong," she said. Somehow a hole formed near the bottom of the slide when the boy was going down. "It was like the slide had just almost been inflated. It just opened up, bubbled," said Mayor Dan Devine. Devine said the city secured the area right away. On Thursday morning kids were still playing around the caution tape before engineers took the slide down. "We had been in touch this morning with the manufacturer, with the designer, the installer, none of them had never seen anything like this before," Devine said. The mayor said there are tens of thousands of slides like the one in question out there. "They have put these structures all over the world, in all sorts of climates, all different countries," he said. Police don't believe there was anything suspicious about what happened so this isn't a criminal investigation. "I don't know. It might be some kind of chemical reaction. It might be some kind of gas plastic reaction," Devine said. It's hard for parents to ignore what happened. "It's just weird that that would happen you know to a slide," said Andrea Schoenbeck, another mom. However, families are still using the playground. "Yes, I am until they fit it then it's safe," said Ilias Deliziannis, a grandpa. There are two more slides like the one removed from Reservoir Park in West Allis. City inspectors checked on those Thursday and said they are safe.